This website is brought to you by an old-time established durian supplier who owns a 60-acres durian plantation in Jementah, Malaysia. Not huge but the trees we have are really old and give birth to luscious, fingers-licking & orgasmic Butter Durians. 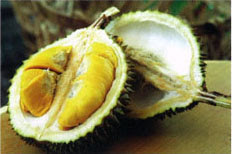 Our durians are high in demand from those who have savoured the heavenly taste before. In 2008, we decide to bring this old trade online, currently only open to the residents of Singapore and Malaysia. Welcome all Butter Durian lovers! Being the trendy and new-age fruit retailer, we decide to bring this old trade online, currently only open to the residents of Singapore offering full delivery service, only to those who want the best butter durians. Officially started on 25 February 2008, we are here to serve you better every durian season. July's season is in and place your orders now!!! No worries. We know that this is your first time buying durians online. Click on the following links for the information you need. aka Mao Shan Wang (Cat Mountain King Durians) or "Kunyit"
APOLOGIES TO ALL FANS WHOM I HAVE TO DISAPPOINT THIS SEASON AS I DIDN'T BRING ENOUGH IN. WILL KEEP YOU GUYS POSTED FIRST HAND THE NEXT SEASON. THANKS & ENJOY THE DURIAN LOVE!! Best Butter Durians in Town! A convergence of traditional growing methods and new-age marketing strategies, the first online durian store based in Singapore, brings you closer to finding the best Butter Durians in Asia.